Wow! What a complicated book!! It started off with 14 year old boy Matt, whose parents died in a car crash when he was just eight years old. As a result of this, Matt goes to live with his mother’s step-sister, his “Aunt Gwenda” and her partner, Brian. But soon after this, problems start to arise with Matt. He begins to steal things until one night, the police catch him in the act. Instead of prison, Matt is given a chance with the L.E.A.F. project – Liberty and Education Acheived through Fostering. Matt is sent into the country to Yorkshire, Lesser Malling, to live with a woman called Mrs Deverill. But when Matt arrives in Lesser Malling, he sees that there is something strange about his foster mother, about the whole village… It seems that they are up to some sort of witch-craft – black magic? Surely not? Strange voices and lights in the night – what could they all be doing? And what does Matt find out about himself? If you want a freaky, slightly frightening story – this is the book for you. The beginning was quite mysterious and frightening – certainly not to be read at night!! Anthony Horowitz is a very good author, but I wasn’t too fond of his “Alex Rider” series. 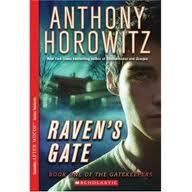 However, Book One in the “Power of Five” series, Raven’s Gate is an excellent story! The beginning is scary and exciting, but as it progresses towards the end, it calms down a good deal – and I found myself breathing a sigh of relief. Rating: 9 out of 10, Anthony Horowitz managed to capture my attention the whole way through and made me feel as if I was in Lesser Malling with Matt! This book is definitely worth reading – thumbs up from me! !